A dog holiday...planing a holiday or a weekend around your dog/s can be much easier then we thought. My husband and I have come to the conclusion that some of our best holidays or just weekends away are the ones spend with our dogs. 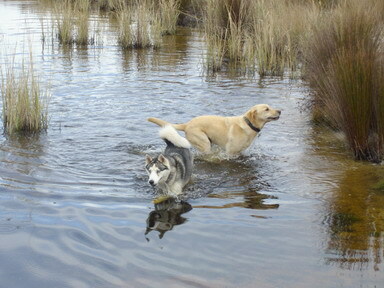 There is nothing that makes me so happy then to see my dogs running wild on a farm in the bush free Yip, absolutely free. No leashes, no cars, no other dogs. Just us and our 4 dogs having a blast. Of course we have encountered the odd scorpion or so on our door step, but that could happen if the dogs are there or not. And actually they usually make us alert of unwanted guest way more quickly then we would have been. Off course we do not harm any wild animals, we just make sure we get out of their way since it's their home. 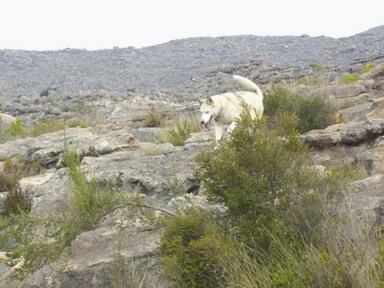 The pleasure of reaching our destination, opening the back of our bakkie/truck and the dogs jumping out is price less. When we first arrive at a place that looks bushy, Gephetto our Lab starts panting mad, his eyes open as wide as they can possibly stretch and his tail wags from the one side to the next bumping everything around that comes in his way. He looks like he is going to crawl through the front window at anytime. Finally we arrive...they start sniffing the grounds as we unload into the little cabin. And then off they GO! About every 15 to 20 minutes they would start taking turns to come and check in on us, just making sure we are still where they last left us. After a few trips of running a few km we will go for a walk with them. Fearfully looking out for danger areas as if they haven't been at that exact same spot a few minutes ago without us I try and lure them back to me with round about turns and left and right turns. Ice my smallest Husky being the leader most of the time on these expeditions mostly decides where to lead the pack. This could be running down a field, up the mountain or swimming in a dam. But they all do decide at some point where they would prefer to sniff and run. We usually do this over weekends so for 3 days this is mostly what they do. In the evenings they will come and join us by the cabin while we sit by the fire and enjoy the quiet nights of nature. There is no reason why you can't sometimes include your dog/s in the pleasure of going away with you. This is an excellent way to bond and you would be amazed at the fun time you will have. The best part is that for the next day or two home your dog will be really tired and content lying on the couch or by your feet. Things to remember depending in which area you are: Snakes like warm weather, bring along your first aid kit and traumheel for most injuries and sprains, tick prevention and some dog treats for the nights by the fire. Places to go to in South Africa. Some of these we have been to and it's very important to ensure that you respect the rules of each guest house or camping site so that we can keep on enjoying this privilege. For more info on this, you could get your Pet friendly directory at your nearest bookstore. For those holidays the fury kids can't come along I am happy to invite your dog/s to come visit me. Please click on the link below for more detail. Wishing you the best and safest trips with your dog ever, Louise and her team.